SYNOPSIS: From Disney•Pixar comes UP, a comedy adventure about 78-year-old balloon salesman Carl Fredricksen, who finally fulfills his lifelong dream of a great adventure when he ties thousands of balloons to his house and flies away to the wilds of South America. But he discovers all too late that his biggest nightmare has stowed away on the trip: an overly optimistic 9-year-old Wilderness Explorer named Russell. From the Academy Award®-nominated director Pete Docter (“Monsters, Inc.”), Disney•Pixar’s UP invites you on a hilarious journey into a lost world, with the least likely duo on Earth. 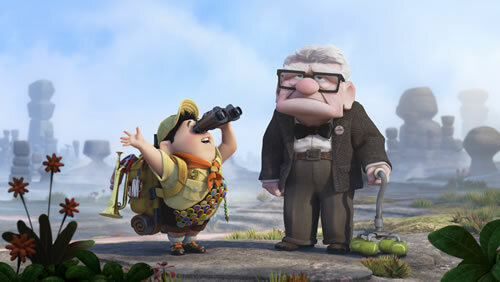 UP will be presented in Disney Digital 3-Dä in select theaters. Dug: My name is Dug. I have just met you and I love you. Once you meet Dug, you’ll love him too. He is as adorable and cute as this movie . . . and it’s a talking dog! I’m a fan of all things Pixar and this one is no exception. Although I will say that this is a little different from what you might be accustomed to from Pixar. I would also say it’s not the best from Pixar but it is still very good nonetheless. It is just as colorful with beautiful graphics. You find yourself attached to the colorful characters as well. The story is chock full of positive lessons too. What makes it different is that this one is more “human”. It will tug at your heart strings more than any other. Remember the beginning scenes of Finding Nemo and how sad it was and how it at least almost made you cry? Well, I’ll admit that I got teary eyed a few times while watching this film. I think this one tops Finding Nemo. It is a very touching story with characters that you will feel for. But it is a lot more than that. The “Spirit of Adventure” is evident through and through. You are along for the journey in this balloon floating home with Carl and Russell. Russell, by the way, really adds to the cuteness factor of the movie. One of the many lessons that this film teaches is that it’s never too late to go on an adventure. It’s even better when you are well accompanied. This one is worth the watch.